If you’re a mom of an infant, you’ve probably stopped wearing delicate jewelry and you sport a perma-ponytail so your wee one doesn’t pull your hair out by the fistful all the live-long day. Or is this just me? You may not be rocking your bling anytime soon, but in the meantime, tuck away those tresses and don some Chewbeads. Now you can dress-up the spit-up by accessorizing with these clever necklaces and bracelets that your teething babe may gnaw, tug and and drool on til his heart’s content. Made from 100% silicone, they’re like a chewy pacifier that can’t be tossed on the ground. Chewbeads are free of BPA, PVC, phthalates, cadmium, and lead. They also provide a nice focal point and toy for easily distracted babies during nursing sessions. If you're a mom of an infant, you've probably stopped wearing delicate jewelry and you sport a perma-ponytail so your wee one doesn't pull your hair out by the fistful all the live-long day. Or is this just me? You may not be rocking your bling anytime soon, but in the meantime, tuck away those tresses and don some Chewbeads. Now you can dress-up the spit-up by accessorizing with these clever necklaces and bracelets that your teething babe may gnaw, tug and and drool on til his heart's content. Made from 100% silicone, they're like a chewy pacifier that can't be tossed on the ground. 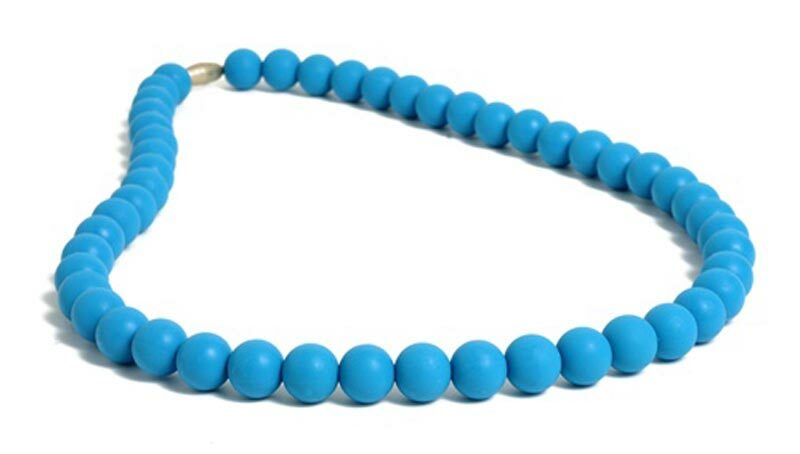 Chewbeads are free of BPA, PVC, phthalates, cadmium, and lead. They also provide a nice focal point and toy for easily distracted babies during nursing sessions.